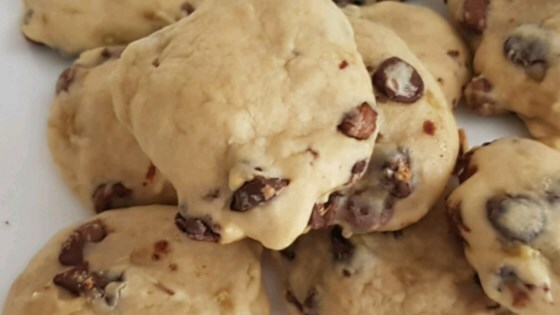 "These cookies are nice change of pace from the regular chocolate chip cookie. They have extra sweetness form the ripe banana and milk chocolate chips." Preheat oven to 350 degrees F (175 degrees C). Grease cookie sheets. Sift together the flour, baking powder and salt, set aside. In a medium bowl, cream together the butter and brown sugar. Beat in the banana and egg, then stir in the vanilla. Gradually stir in the dry ingredients until well blended. Fold in the chocolate chips and walnuts, if desired. Drop by rounded spoonfuls onto the prepared cookie sheets. These amazing cookies are good for the heart AND for the taste buds. Very delicious recipe! Just like eating little mini-loaves of banana bread. My husband simply loved them to take as a quick breakfast on the way to work. Easy to make, but they taasted rather flat. I doubled the recipe, perhaps that made a difference.